Suite à un commentaire de l’article précédent, j’ai décidé d’exposer une méthode plus fiable. print "Couldn't open CloudIpChecker.ip for reading saved ip, create the file." 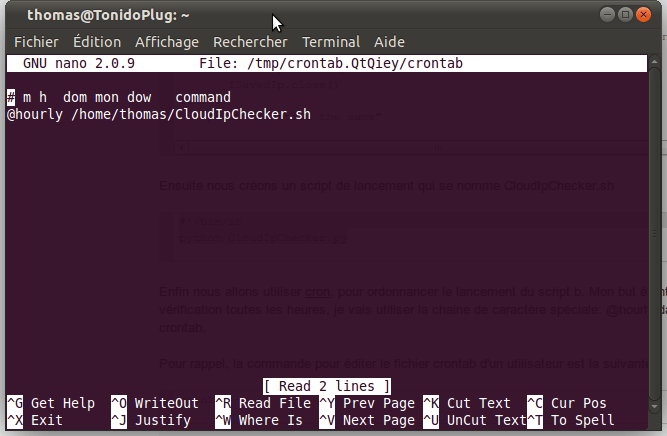 print "CloudIpChecker.ip found, read saved ip." print "Couldn't create CloudIpChecker.ip for writing new ip!n"
#!/usr/bin/python ''' Created on Aug. 10 2011 @author: Thomas Bores ''' import urllib2 import time, datetime import smtplib from email.mime.text import MIMEText def get_localTime(): # Get current local time return str(datetime.datetime.now().strftime("%Y-%m-%d %H:%M")) def send_mail(ip): # 1. Prepare mail content mailContent = localtime + "nIP changednNew IP is: " + ip msg = MIMEText(mailContent) print "IP changed, send a notification by email with the following content:" print mailContent # 2. Add a subject msg['Subject'] = 'Cloud has a new IP - '+ip # 3. Use my gmail account to send the mail mailServer = smtplib.SMTP("smtp.gmail.com", 587) mailServer.ehlo() # 4. Of course, we use a secure connection mailServer.starttls() mailServer.ehlo() mailServer.login('your_account@gmail.com', 'password') mailServer.sendmail('your_account@gmail.com', 'your_account@gmail.com', msg.as_string()) mailServer.close() # *** main program *** saved_ip = None # Check if we already have a saved ip try: fSavedIp = open("CloudIpChecker.ip", "r") except IOError: print "Couldn't open CloudIpChecker.ip for reading saved ip, create the file." else: print "CloudIpChecker.ip found, read saved ip." saved_ip = fSavedIp.readline().rstrip("n"); fSavedIp.close() # Connect to a website that returns the ip # Please avoid to overload my website, use your own url = 'http://www.bores.fr/ip.php' ip = urllib2.urlopen(url).read() if saved_ip != ip : #Save the new ip saved_ip = ip # Notice me by email about ip change send_mail(ip) # Save the new ip try: fSavedIp = open("CloudIpChecker.ip", "w") except IOError: print "Couldn't create CloudIpChecker.ip for writing new ip!n" else: fSavedIp.write(ip+"n") fSavedIp.close() else : print "IP still the same"
Enfin nous allons utiliser cron, pour ordonnancer le lancement du script b. Mon but étant de faire une vérification toutes les heures, je vais utiliser la chaine de caractère spéciale: @hourly dans mon fichier crontab.